In the seventeenth century, alchemy was a dangerous business. Yes, there were risks of sanctions by the authorities, which could be very harsh, but great dangers also lurked in the chemicals themselves. Some like lead and mercury accumulated in the tissues slowly, over a period of years, others could kill a man within a few minutes. Cardinal Francesco Maria del Monte had personal knowledge of just how deadly the products of alchemy could be. In Rome, Del Monte was the unofficial ambassador to Florence and the Medici family. He regularly greeted dignitaries from around Europe and dazzled them in his sumptuous palace. He was an avid glass collector, a patron of the arts and more quietly a dedicated student of alchemy. He was a lifelong friend to Don Antonio de' Medici and visited the prince's laboratory in Florence several times. 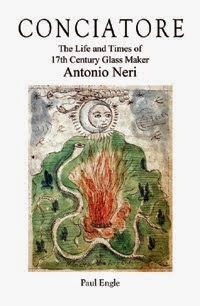 This is where Antonio Neri was making glass early in his career. Later, Neri worked at a secondary Medici glass furnace in Pisa, where the cardinal had fancy glass table service made for the Vatican. 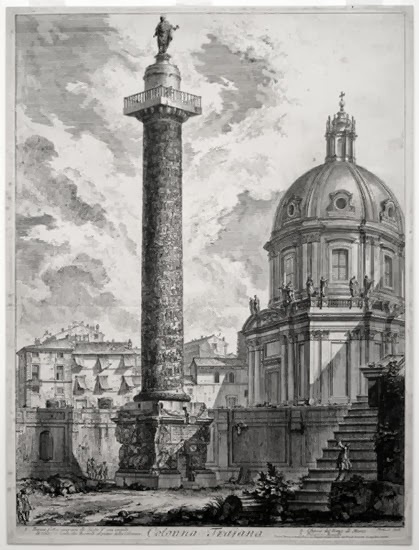 About a two mile walk from Saint Peter's Basilica, over the Tiber River, directly toward the Colosseum, is Trajan's Column. It commemorates Emperor Trajan's victory in the Dacian Wars at the beginning of the second century. It displays a scroll in base relief that winds all the way from the pedestal to the capital. The monument is large enough to contain an internal staircase leading to an observation platform at the top. In 1587, it was crowned by a bronze statue of Saint Peter that still stands today; the initial model was sculpted by artist Tommaso della Porta, who was under the patronage of Cardinal Del Monte. That man [della Porta], I think, suffered mentally and it showed at the end of his days. When he felt some kind of tingling in his abdomen, he went to the Cardinal del Monte his friend and master and asked for some of the "grand duke’s oil" that he hoped would relieve the tingling. The Cardinal indulged him; gave it to him and said that he should apply it only to the wrists and only a little, because the oil was potent and it could make him feel sick. He took it and went back to his house and after dinner he sent for the barber, to administer the medication, and while the messenger went on, Tommaso impatient and simpleminded, applied the oil himself and instead of touching the wrists, as the Cardinal had instructed, he lathered the arms, chest, body and entire abdomen, so that the powerful oil went to the heart and in fact killed him. The barber arrived to medicate him, found him dead and all attempts at revival were in vain. Tommaso della Porta, was buried at Santa Maria del Popolo. The "grand duke's oil," was widely known, and widely cited in references throughout Europe well into the 19th century. Its other name was oil of tobacco – essentially a distillation of almost pure nicotine. In very small doses, it acts as a stimulant of the central nervous system, in slightly higher doses it is a narcotic, even greater, but still relatively small amounts act as a quick and lethal poison absorbed directly through the skin. Ingesting a single pill capsule of typical size full of pure liquid nicotine is more than enough to kill an adult in short order. This story has one final twist. Antiques dealer Domenico Lupo was one of the men present at the reading of Della Porta's will on 7 March 1607. Twenty-five years later, an inventory of Lupo's assets listed a "small figure half old and half new that is said to be of Prior Ant. Neri," either the glassmaker or possibly his great uncle.